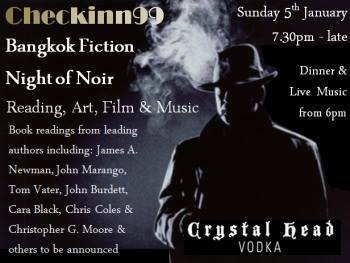 The second Bangkok Night of Noir had a fantastic line-up of mostly Asia based crime writers: Cara Black, James Newman, John Burdett, Christopher G. Moore, Dean Barett, John Marango and painter Chris Coles. I read a chapter from The Man with the Golden Mind, which is out with Exhibit A in April. Check out a photo series from Bangkok Night of Noir Fiction.